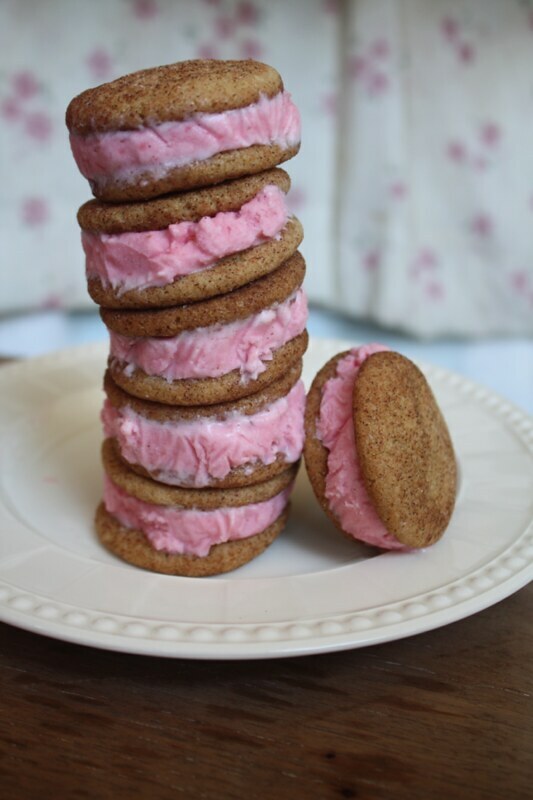 I wanted to follow up on my last post to let you know that I made ice cream sandwiches with that plum ice cream. They're perfect little treats! I mentioned in my last post that the ice cream seemed like it'd be a great consistency for ice cream sandwiches: it firms up well, but it doesn't get rock solid. It ended up working PERFECTLY for sandwiches. They don't slide apart when you bite into them. And the cookie recipe I used even stays a little soft when frozen (so you don't feel like you're eating a rock). 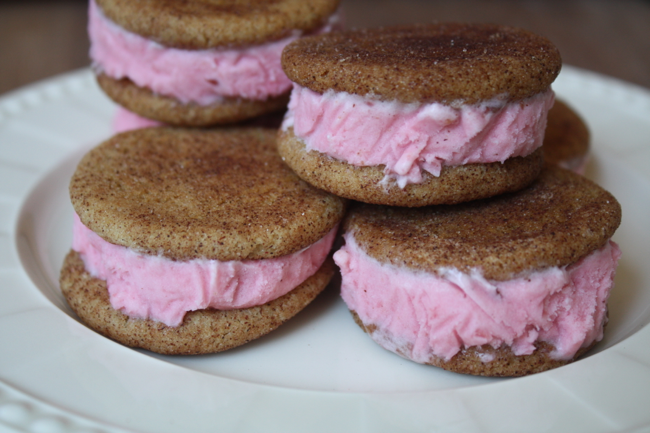 And don't gingersnaps sound good with plum ice cream? Mmm. They are. 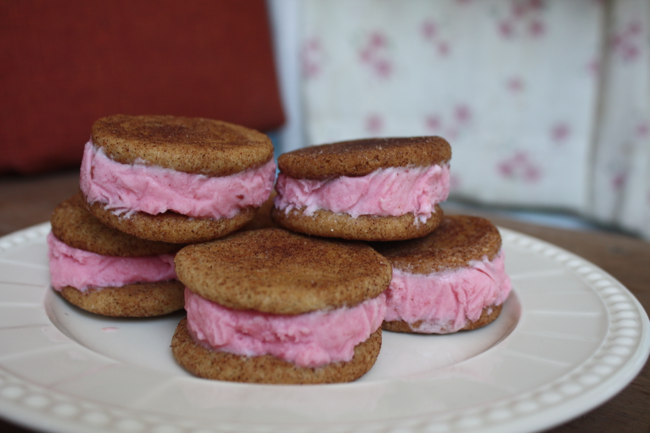 I made smallish gingersnaps (for smallish ice cream sandwiches). 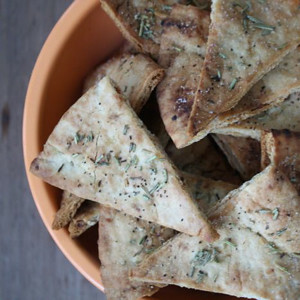 They're 1.5 inches wide (great for snacking, *cough). I realized a few sandwiches in that they should be assembled with the bottoms of the cookies facing out - that way they sit flat. I wrapped the sandwiches individually in saran wrap and put them in the freezer to firm up. Now I didn't consider the fact that the saran wrap's wrinkles would leave their impressions in the ice cream and make the ice cream sandwiches look like wrinkly little messes. Of course, let's be honest, if I had realized that, I probably wouldn't have spent too much time trying to make sure the saran wrap was perfect, anyway. 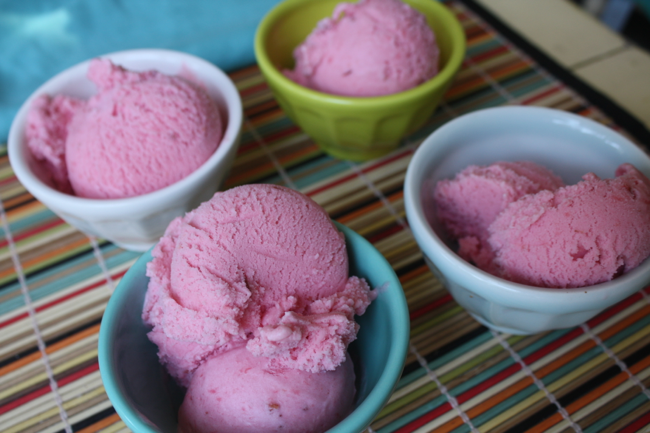 Here's the recipe I used for the plum ice cream. 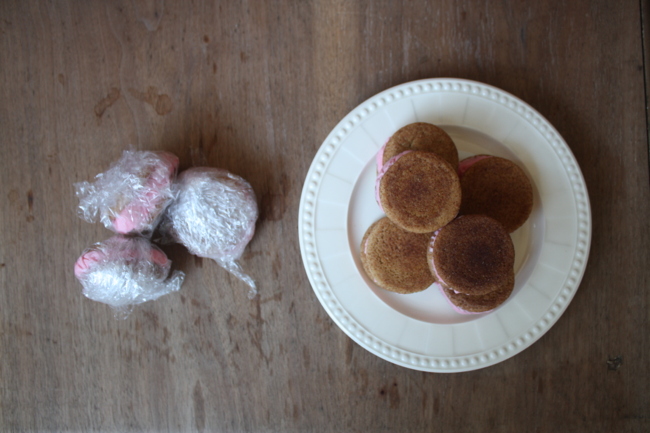 Here's the recipe I used for the gingersnaps. Happy stone fruit season, everyone! I realized recently that plum season doesn't last as long as peach season does, and I've definitely been favoriting peaches lately... So I thought I'd fix it by eating lots of plums this week while they're still sweet and beautiful. 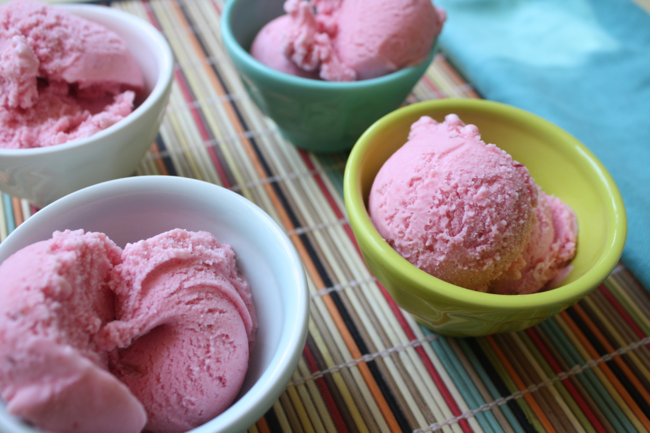 And, wouldn't you know it, I made some ice cream, too. 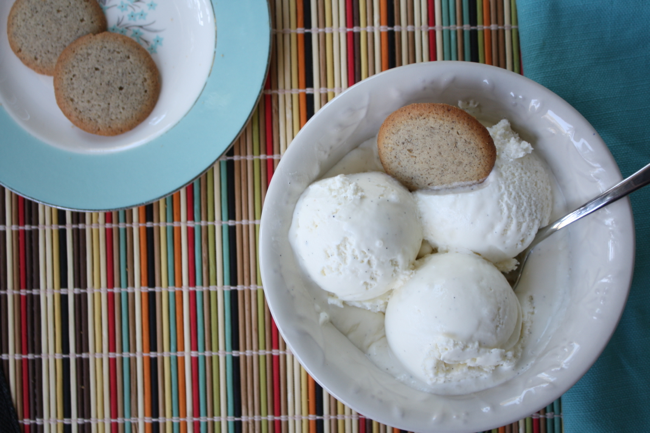 This recipe is from David Lebovitz's The Perfect Scoop (but paraphrased...). It has only 5 ingredients (yay). 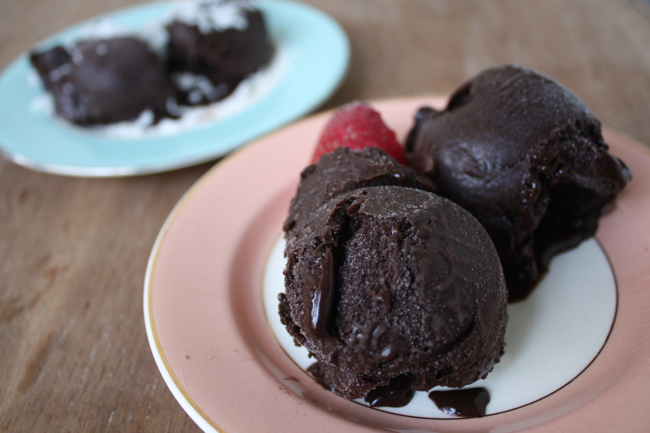 For some reason, I've had better luck getting the perfect ice cream consistency in recipes that don't contain eggs. So generally I skip over recipes that do. Plus, holy cow, this recipe is so simple. The ice cream was very creamy, indeed. It firmed up very quickly in the freezer but never became super hard. For that reason, I think it would be perfect for ice cream sandwiches... hm... I'll keep you updated! I made the batter the day before and it saved perfectly. Now the recipe calls for Kirsch (a liqueur), but I used some vanilla extract instead. Also, a few of my plums weren't very ripe, so I peeled some skin off of those. I also added an extra spoonful of sugar. Cut the plums into 8ths, removing the pits. Add to saucepan with the water and cook over medium heat, stirring occasionally, until tender (about 10 minutes). Remove from heat and stir in sugar. Cool to room temperature. Add heavy cream and vanilla extract (or Kirsch) and puree. Cover batter and chill in refrigerator. Freeze according to ice cream maker's instructions. Makes 1 quart. Hello, dear reader! Happy Monday! I am officially in a state of limbo, having finished my full-time job last week and ready to begin graduate school in about a month. I graduated from college a year ago in May, planning to take one year off before continuing onto graduate school. Today, as the year is coming to an end, I can confidently say that I'm very happy I took the time off. Besides getting acquainted with a new (and beautiful) part of the country, saving up from a year's worth of working, and having some time to take a breath from school, I have learned a lot about myself. I'm one of those people who loves school, and I was surprised to discover that I behave pretty differently when I'm not in school (i.e. how I take care of myself, motivate myself, and in general structure my life). After having been in school for as much of my life as I can remember, how could it not be exciting to discover a new layer of myself? Up until this year, I was kept plenty busy with goals I was trying to attain. They were all so natural, just following a path that had been laid out for me by teachers, parents, institutions, and (at some point) myself. In many ways, it was so easy to for me to get through because goals were so clearly laid out for me. You know: If you want to get an A, you need to do this homework; if you want to get better at piano, here are the ways you should practice. Surely it's not always so simple. But in general, someone was telling me where to be, what time, and how to be prepared for it. That I can do. This year, my schedule and goals were a blank slate. I chose when and where to be, what to learn, and how to evaluate myself. That... I was not so good at. It involved a lot of sifting through myself to figure out what's important to me and how I can best use my talents to serve the world. And though I learned a lot, I feel like I've just barely scratched the surface. I know, I sound like an early-twenty-something off to find herself. But that's what I aaaaam! Sigh. SO. In these few weeks off, I'm studying, practicing, and trying to finish up several little projects around the apartment, starting with these pillow covers. 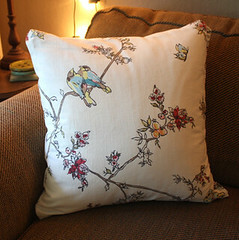 This black and white pillow below (from CB2, a few years ago), was our only couch pillow. It's SO COMFORTABLE, but it's old and dirty (please observe), and it doesn't go with the room. 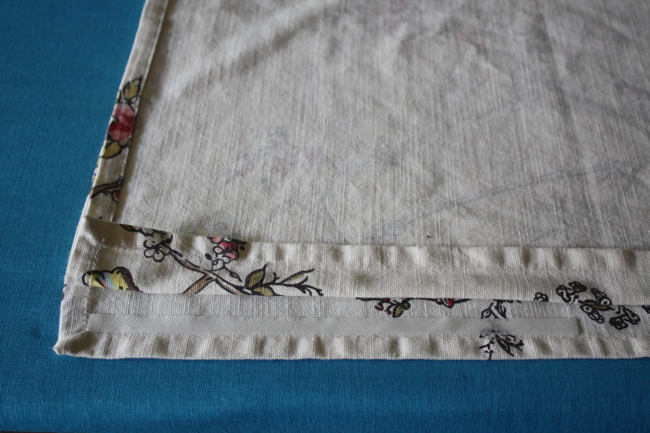 Conveniently, I have these darling napkins which I like so much I wanted to display them. Plus, I've had them for months and never used them because I don't want them to get dirty. Obviously it was time to use them for something else. 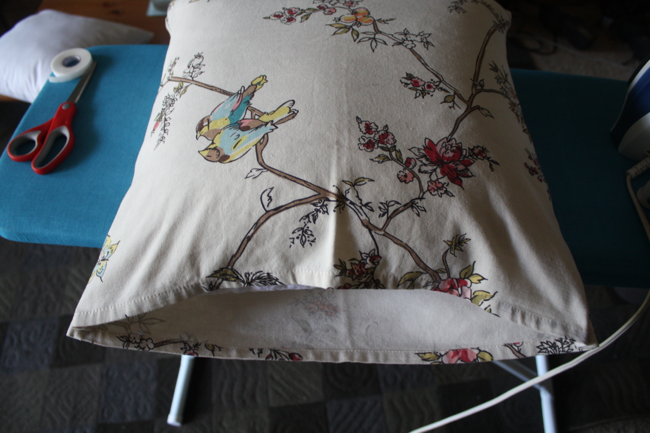 I don't have a sewing machine, so I used heat-bond hem tape on 3 sides of the cover, put the pillow inside, then sewed up the final edge by hand. Iron the napkins well. Line them up together, face to face. Lay a piece of hem tape JUST inside the hem of the napkin. If you put the tape directly on the hem, it will have thicker, bumpier fabric to bond and won't be as strong. Now proceed to the next section. And continue until you've finished 3 sides of the square. Be sure to fold the corners under evenly so they look neat. 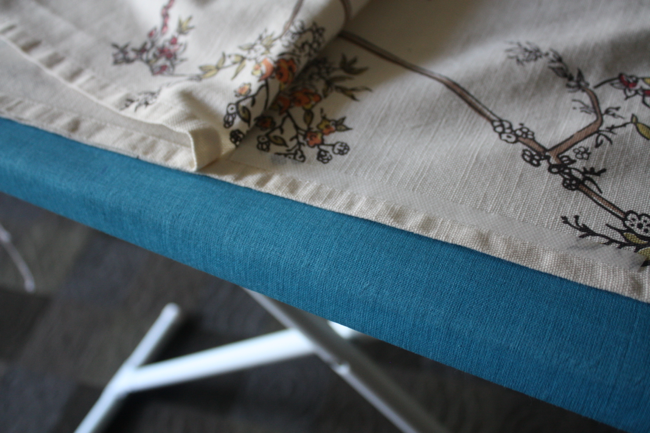 It helps to iron them exactly how you want them before adding the tape. Then turn it right-side-out, and iron well once more. 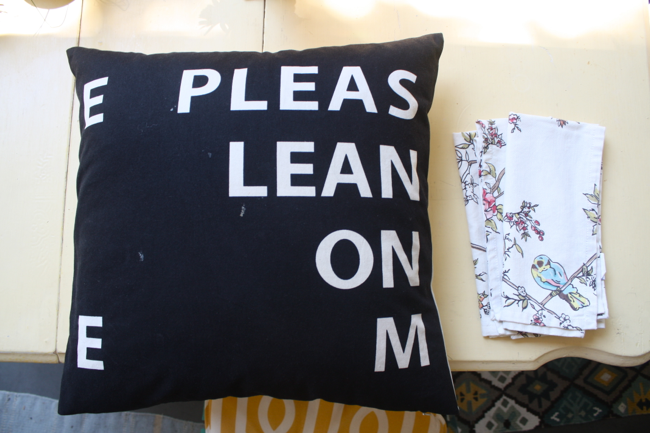 Slip the pillow inside, and sew up the edge. Voila! Well, I'm back with more ice cream. Just what you needed, maybe? Hope so. In case you saw my recent post about making vanilla extract and were inspired to order vanilla beans in bulk, here is a great way to use some of them. 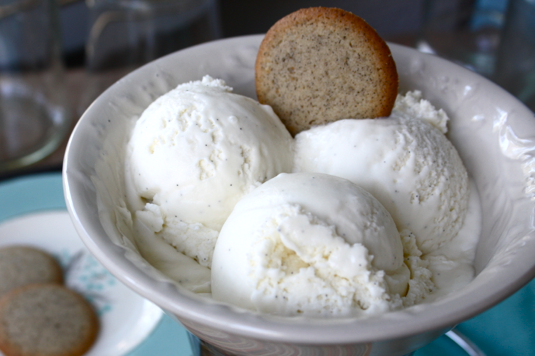 Good ice cream is such a fresh, delicious way to show off and indulge in that pure vanilla bean flavor. This recipe is very creamy. 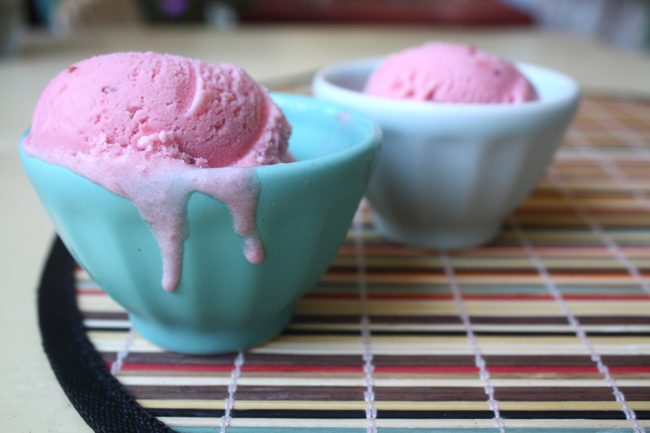 Unlike other ice cream recipes I've made, this one stays relatively soft when frozen. Don't be alarmed as I was when, after 24 hours of occasionally checking it, I started thinking there might be something wrong with my freezer. It's not going to get totally hard. And have you ever had Trader Joe's brand vanilla bean wafers? Holy crap. They're so stinking good. Combine all ingredients in a large bowl. Follow ice cream maker instructions. Sunday brunch is a thing around here. But waffles, the poor things, never get included in the menu. Here's how lazy I am sometimes: just the idea of dragging out the waffle iron and cleaning it afterward is tiring to me. Actually, I don't remember where our waffle iron came from, but it was a hand-me-down from somewhere. The hinges are completely gone, so you have to hold the raggedy thing together to keep the cord in, and it's plenty stained. Hm. Its old age makes my laziness more acceptable, right? Well, either way, I decided it was time for the weary thing to go. Knowing well that I'm not going to buy a replacement - at least not in the foreseeable future - I got rid of the thing, but not before one last killer batch of waffles for Sunday brunch. 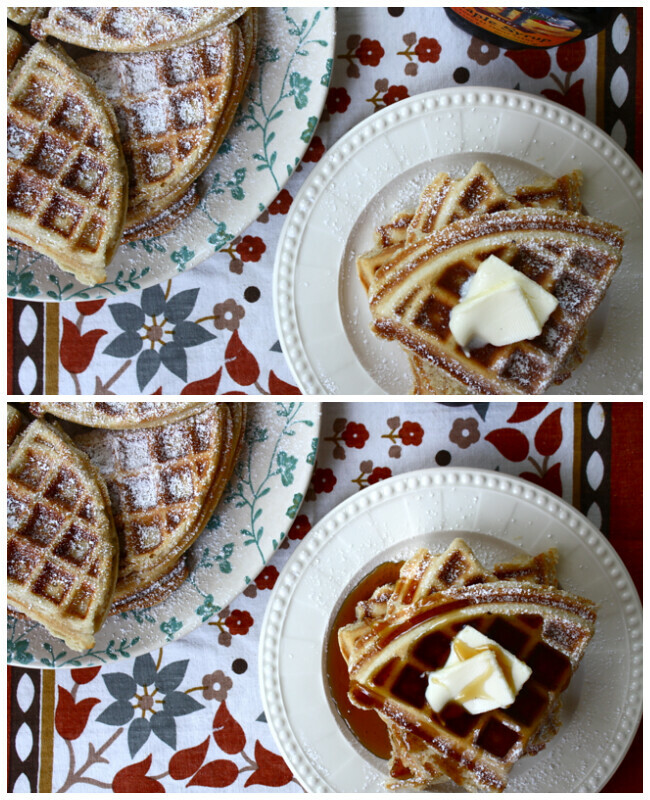 Thus I bring you the last batch of waffles this home will see for a long time: vanilla gingerbread. I gotta say, these waffles were so yummy that I was tempted to save my old iron's life, but I stayed strong and simply enjoyed every last bite of these. Happy weekend. Hope you have a wonderful one. 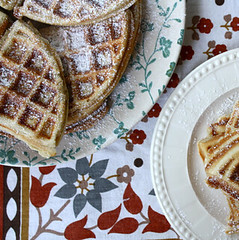 And if you're Sunday brunching, give these a try. In a large bowl, mix together dry ingredients and spices with a fork. Set aside. In a medium bowl, beat eggs. 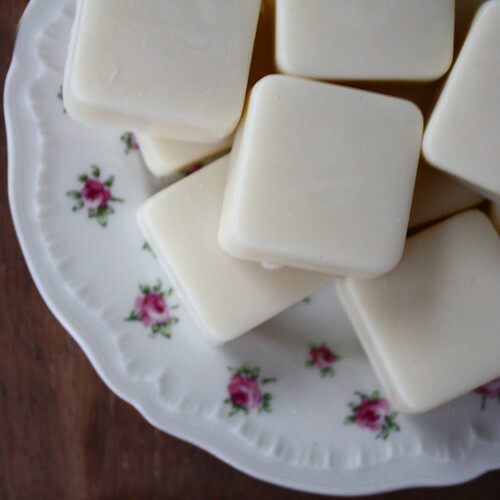 Stir in milk, butter, and vanilla. Stir wet ingredients into dry ingredients. 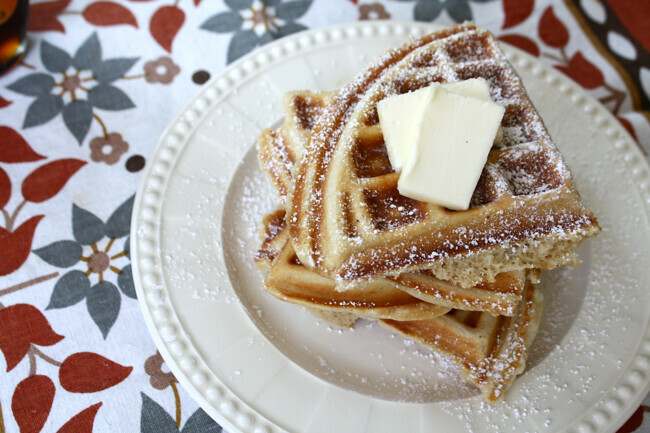 Spoon batter into preheated waffle iron and cook until golden brown. Yep. Made ice cream with bananas, cocoa powder, and almond milk. I know, I know, it's not ice cream. But it's yummy! 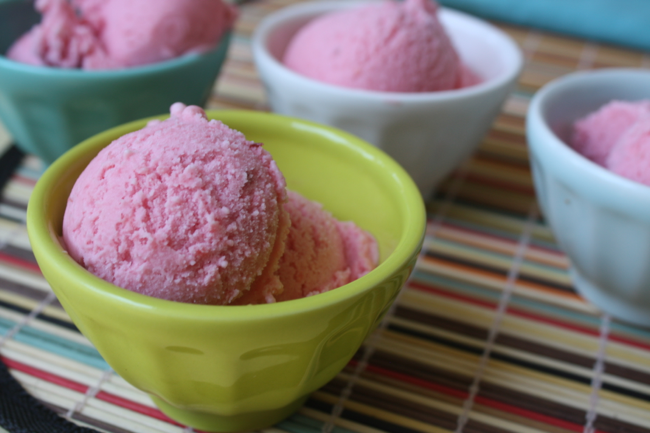 And if you've never tried banana-base "ice cream," it's really worth a try. When you blend up a frozen banana, it has the creamiest texture, pretty much as close to ice cream as you can get. But it's fruit! 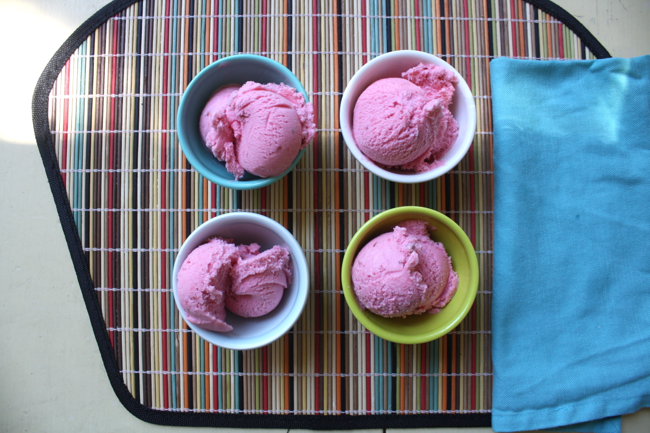 I've been experimenting with ice cream from bananas for a few years - try peanut butter, coconut milk, or fruit puree. But this is my favorite. 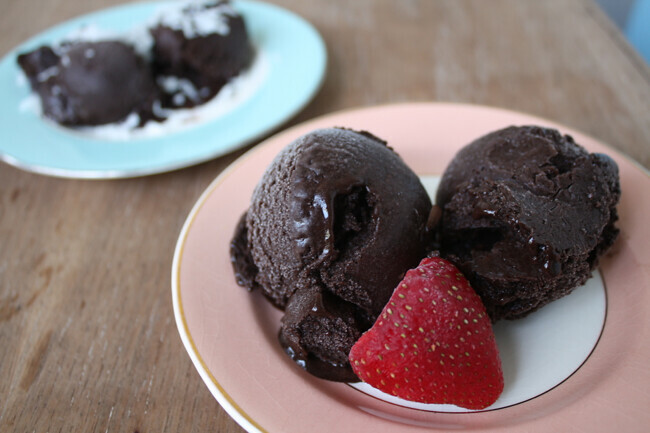 The banana flavor does come through, but it's still chocolatey and creamy. Can you beat that? Slice bananas into disks. 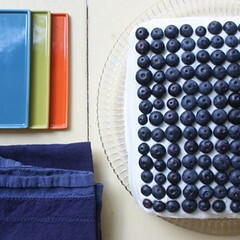 Lay out on a plate or cookie sheet, and freeze. 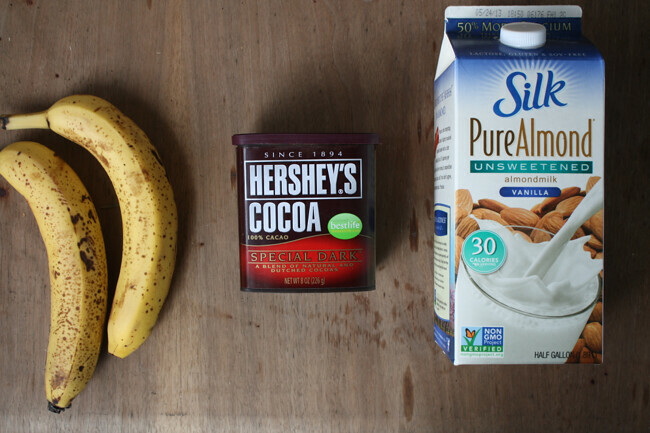 Place frozen banana slices in a blender and blend until smooth. It will become very creamy, like ice cream. Add cocoa powder and milk, and blend until smooth. 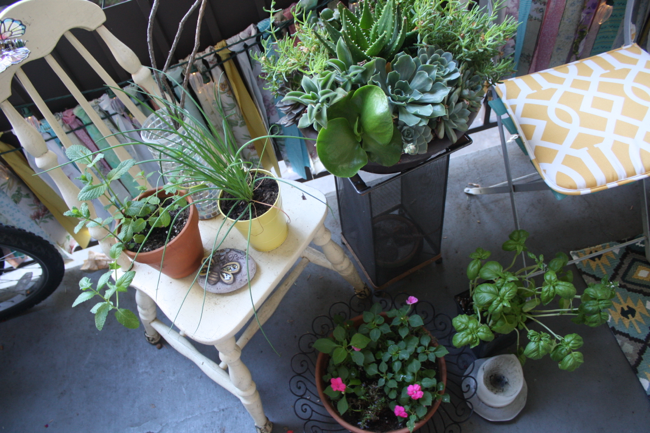 I've been working hard to "summer up" our balcony, and I'm happy to say that we're now enjoying a very lovely space! It's pretty (yay); it's practical (still using it for storage); and it's usable (you can get comfy out there - day or night; alone or with friends; reading, eating, sleeping, whatever). 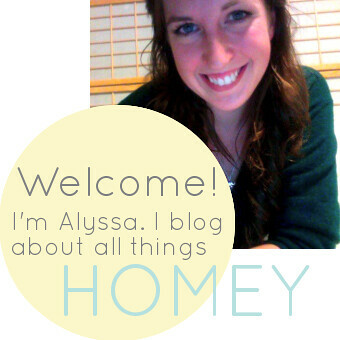 I'm really excited about the space, and I'm excited to share it with you! 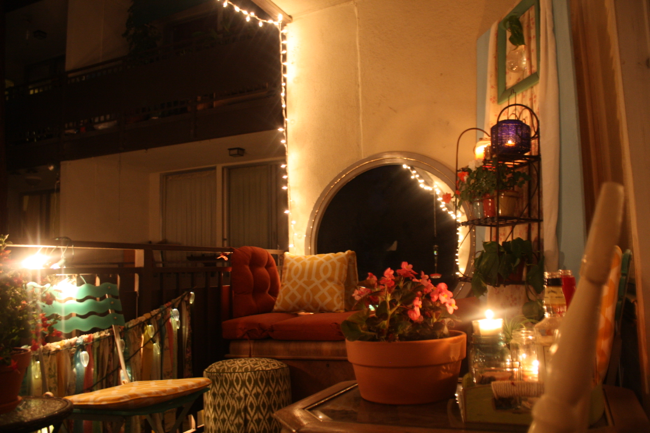 And to share ideas and tips for your own balcony/patio, so you can get out there on... those su-um-mer ni-hights. 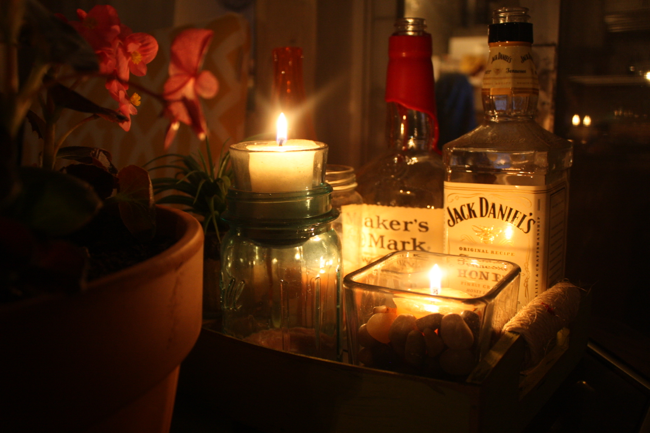 Something's pretty enchanting about being with friends on warm-weather nights, especially if you've got twinkle lights and booze. When I lived in Illinois, I spent my summers at home (my mom's house), where I was absolutely spoiled by ideal settings for those enchanting kinds of summer nights: a beautiful patio, a fire pit, a big open pasture (we used to have horses). And we lived in the country so, of course, stars. Always stars. I DEALT WITH THE NARROW SPACE by arranging the seating as circularly as possible, while offsetting the chairs so that no one is sitting directly across from someone else. I also used a big mirror at one end of the patio to make the space seem bigger. 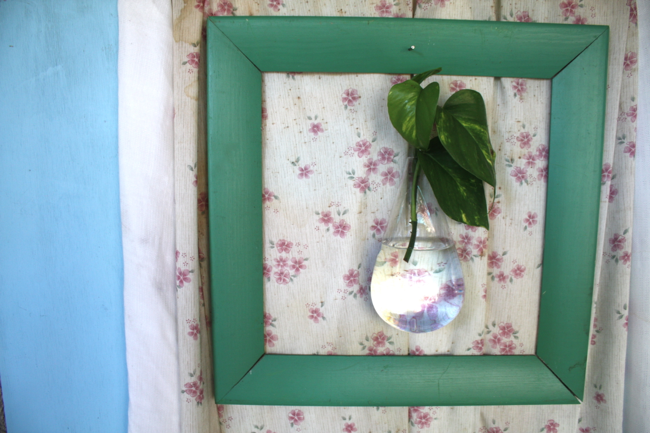 The mirror is from an old dresser set, and simply leans agains the wall (so I didn't have to put holes in the wall). 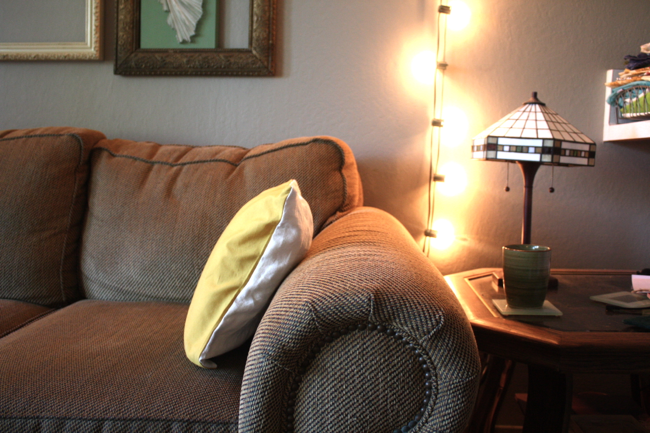 Another must for small spaces is versatile furniture, e.g. chairs that can fold up and be moved, benches or footstools that have storage space inside, side tables with drawers. 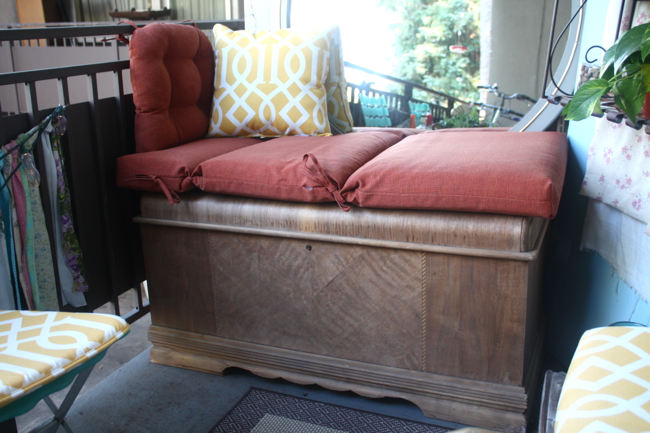 One of my favorite pieces of the balcony is this ottoman (from Target), which we use also as a pillow and a table. AS FOR A SMALL BUDGET, I tried to work with what we had and buy as little as possible. I thrifted and made things by hand (check out my Pinterest for more inspiration). The biggest investment we made was in seat cushions, which was very much worth it (Bed, Bath, & Beyond). 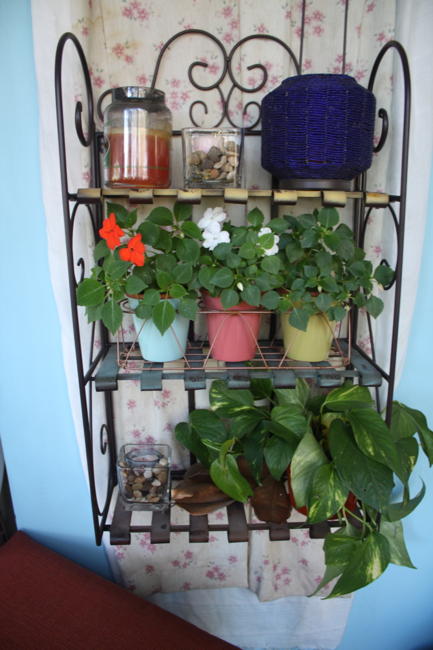 Besides making the space more comfortable, they of course add color and patterns. Mix and match. Not all seats have to have cushions. 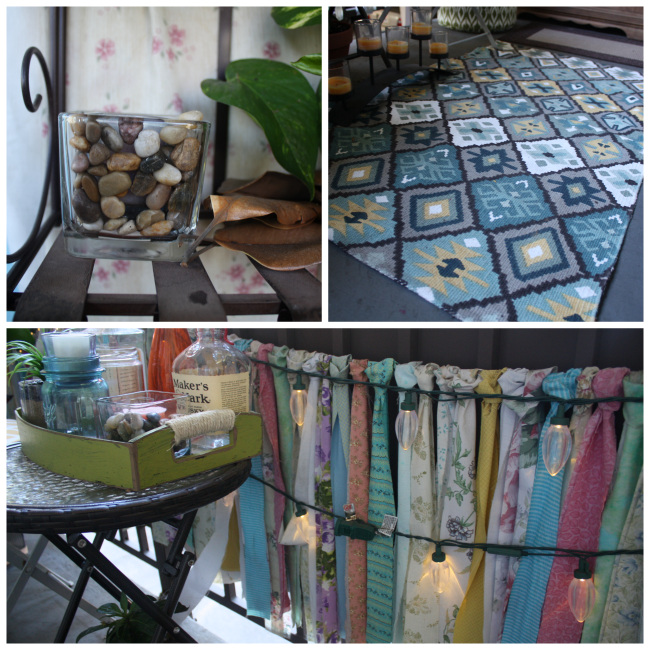 Another quick way to make the patio cozier is to add a rug. 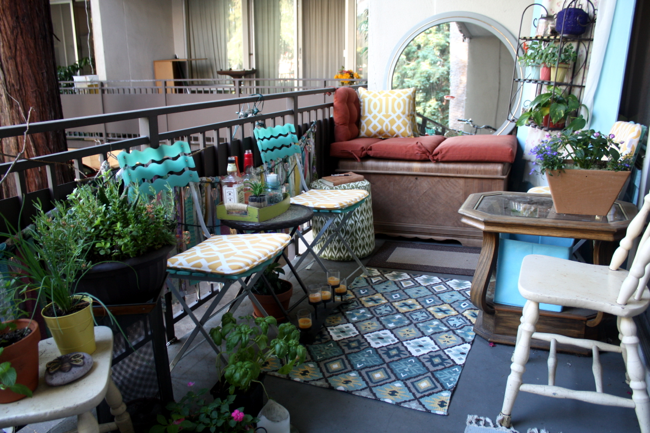 (Our balcony floor seems to be kind of yucky, no matter how much we clean it, so a rug made a huge difference for us. Try TJMaxx and HomeGoods for nice, inexpensive rugs.) 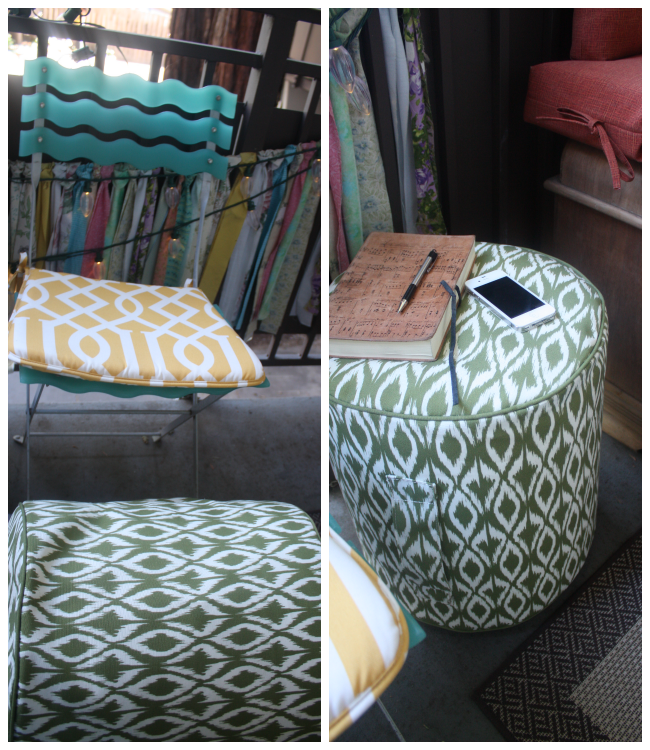 Plus, a rug in the middle of a seating area gives the seating a central focus point and helps tie the area together. I also hit up the Dollar Store, just in case something jumped out at me. You never know what you'll find! I got these square glass candle holders and vase-filler pebbles to use as candle holders (see below). OKAY, ON NOT PUTTING HOLES IN THE WALLS: I already mentioned the large mirror at one end of the patio, which has long legs attached to the back so it can lean against the wall and doesn't need to be hung. I also have this huge piece of plywood (8' x 3'), painted blue. (It used to have a mirror on it but I've now recycled it to something new.) I leaned that in the corner to use as a little patch of removable wall that CAN have holes in it. I hung fabric over the top as a kind of a "background," to make it feel a little more cozy. 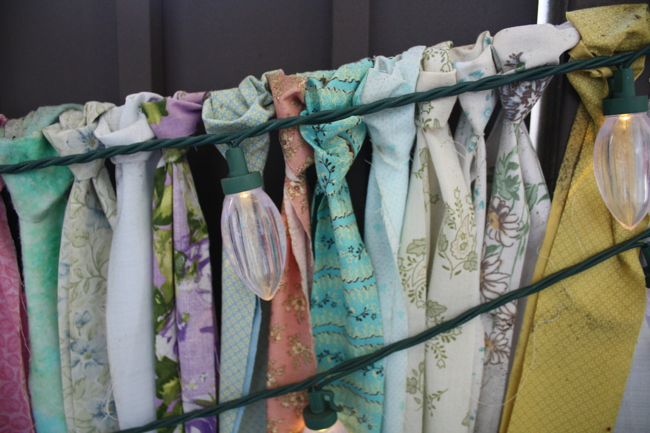 You can do this on the real wall, too: hanging fabric or a curtain directly on a wall requires minimal holes if you use small hooks and a wire. If you're worried about weather-proofing, try a shower curtain. Also, consider putting some holes in the ceiling. I know that's cheating a bit, but you can find tiny hooks (for lanterns, lights, etc.) that would only put a small hole in the ceiling. Plus, hanging from the ceiling adds depth. And after a couple of lanterns are up, you might not need anything on the wall at all. This little hanging starter vase came from CB2. Isn't it darling? 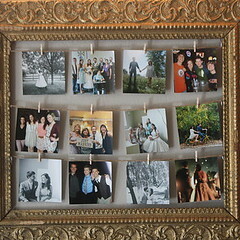 The frame and fabrics were thrifted. USING THE SPACE FOR STORAGE works mostly because we have sectioned off the patio into two areas: seating and storage. We kept the small area to one side of the door for storage only (bikes, garden things, etc. ), and the larger area on the other side of the door is for seating only. With our particular layout, the placement of the door helps section off the space, but some other ways to create sections are: keep walking space between the sections, use rugs to indicate sections, or arrange furniture in a way that clearly excludes the storage section. In addition to creating sections, we have furniture that doubles as storage space. 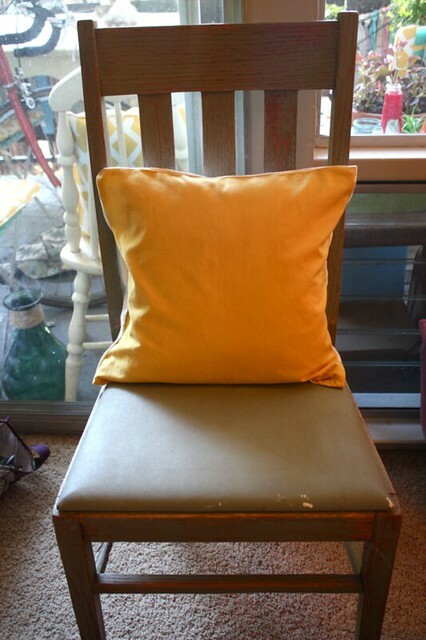 My favorite is my "bench," made from seat cushions and a wooden chest. I know, the cushions look kind of funny like that. 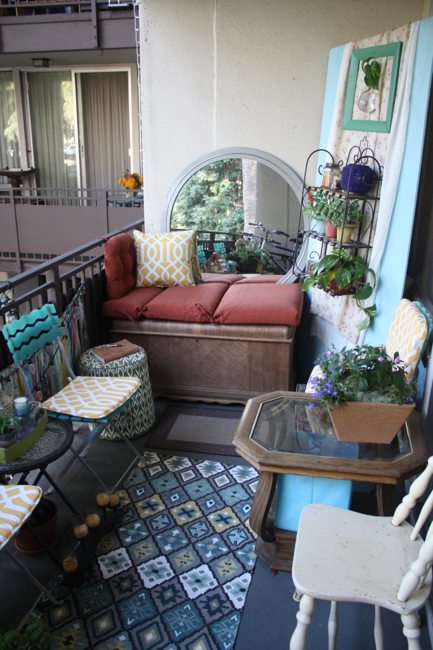 But, hey, the patio already has a somewhat eclectic, thrown-together feel, right? 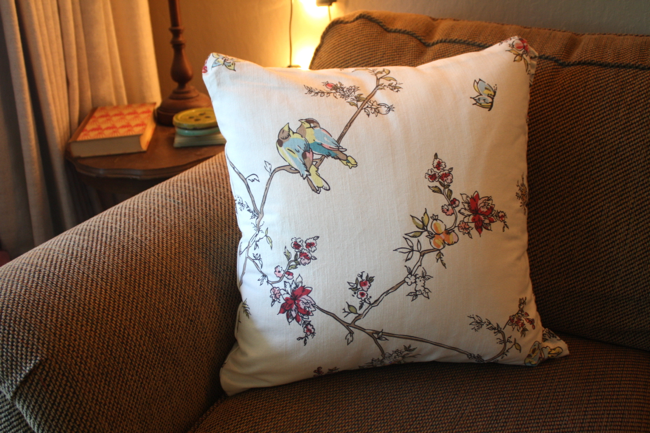 :) And since the cushions are so comfy, it doesn't bother me. Hope this post provided some inspiration for your own outdoor space! It's already JULY, people! So go outside right now, sweep off your patio, and imagine yourself cozied up with friends, twinkle lights, and booze. Your next stop: thrift shop.